On the 4th of May, a car-driver targeted a group of EDL members who were standing outside a pub (the Rookery Tavern) in Wolverhampton. The driver drove his Ford Focus right into a group of 15 EDL and severely injured a man named Jag Singh and less seriously injured another man. Mr Singh suffered from a broken leg and spinal injuries. 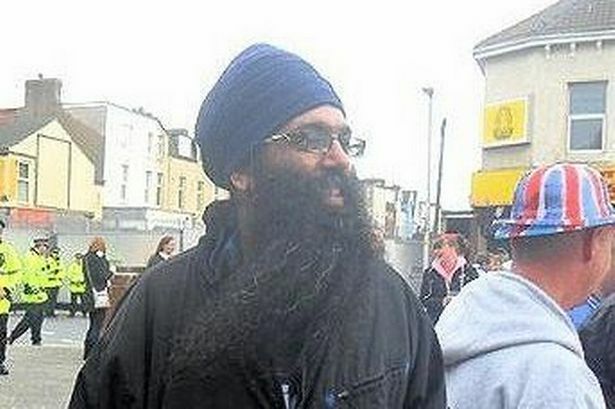 Jag Singh is a long-term member of the EDL and a leading member of its Sikh Division. “It’s a miracle that no-one was killed or more seriously hurt because the car was driving at some speed and its wheels were screeching. So far, detectives have arrested two people: a 47-year-old man and an 26-year-old man. They were arrested, only days later, on suspicion of conspiracy to cause grievous bodily harm. Various news outlets have quoted a “spokesman” for EDL Extra on this violent incident. EDL Extra is actually the Twitter account of Gary Fieness-Hasting's (a.k.a Gary Hastings, Gary Moon, etc.) website EDL News. So there's a very good chance that this spokesman is none other than “Gazza” (another pseudonym of Hasting's). So why did regional journalists ask someone who works for an extreme Leftist “monitoring site” what he thinks about another movement, the EDL; which they themselves classify as “extreme”? It doesn't make sense. This need to ask the opinion of a self-styled expert on the "far right" and the EDL is even more bizarre considering the fact that this hit-and-run incident was not political anyway. According to certain people directly involved in the attack, it had nothing to do with politics. Yes, the people at the pub were EDL members; though it wasn't an EDL event. The Birmingham Mail, ITV News and other news outlets don't seem to realise this fact. Again, why did the Birmingham Mail, etc. quote this Leftist? It seems that no matter how extreme a Leftist is, he is never deemed to be as extreme as people on the Right. So how does that work, exactly? Is it the case that even though most local journalists aren't exactly Hard Left, they are still, nonetheless, somewhat sympathetic to both Leftists and their various very fashionable causes? After all, even if members of Hope Not Hate, UAF, and other self-proclaimed “anti-fash” fascists use violence and promote violence, “their hearts" are still seen to "be in the right place” (as regional journalists sometimes put it). Anyway, this EDL News spokesman offers us a very crude Marxist analysis of Jag Singh. Now that single sentence alone incorporates two useful (to Marxists) and important Marxist theories: “false consciousness” and the notion of an ethnic minority “Uncle Tom”. 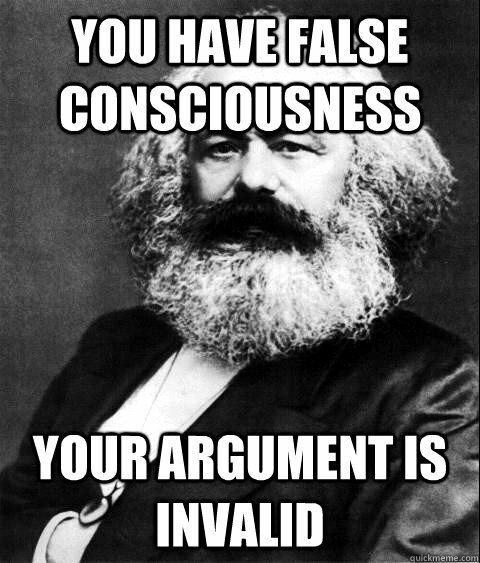 The idea that Jag Singh has been “hoodwinked” must be that he suffers from what Marxists call “false consciousness”. Middle-class Leftists must think that he's “working against his own best interests” by joining a counter-jihad group which is really - as everyone is told - “a white supremacist group”. However, even though the EDL is not a white supremacist movement, it's still a patriotic one. Yet Jag Singh has brown skin and he's a Sikh. Now (the Leftist thinks) what's a brown-skinned person doing being a patriot and fighting against Islamisation? He should be a disgruntled member of an ethnic minority and consequently be begging to be patronised by white, middle-class Leftists like me. Yet, instead, Jag Singh has allowed himself to be “hoodwinked” by lots of nasty working-class whites. So rather than practice (Sikh) Uncle Tomism, Jag Singh should instead have allowed himself to have been hoodwinked by this spokesman for EDL Extra/News. Here this snooty and sneering man brings in the Marxist notion of an ethnic minority Uncle Tom again. What I mean by that is when white, middle-class Leftists aren't accusing people like Jag Singh, Ayaan Hirsi Ali, Chloe Valdary, Irshad Manji, Maryam Namazie, Monica Ali, Ed Husain, Quilliam, Salman Rushdie, etc. of being black and Muslim Uncle Toms, they're accusing them of being “poster boys” or “poster girls” instead. And, my God, isn't “poster boy” a mind-numbing Guardianista cliché? These Leftist automatons use that phrase all the time in these and in similar cases. Anyway, the idea is that Jag Singh is simply a poster boy for all those nasty white working-class people who make up the EDL. That is, Jag Singh has False Consciousness (i.e., he's not a Leftist). Therefore Mr Singh has allowed himself to be hoodwinked by the much cleverer white members of the EDL; who are themselves, in turn, hoodwinked by “Zionists”, “millionaires”, "austerity" and whatnot. Do you get it now? Yes, that's right: only Leftists have True Consciousness because only they are untouched by the platonic “right-wing Media”. And therefore only they can never be hoodwinked. 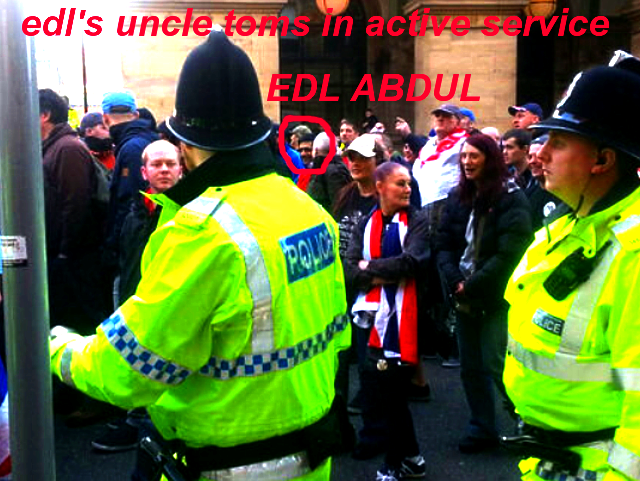 “no doubt the EDL will use this incident to portray themselves as victims." .... Hang on a minute! These EDL members were the victim of a hit-and-run attack aimed at 15 men and women. One of those victims, Jag Singh, was seriously injured: he suffered from a broken leg and damaged spine. 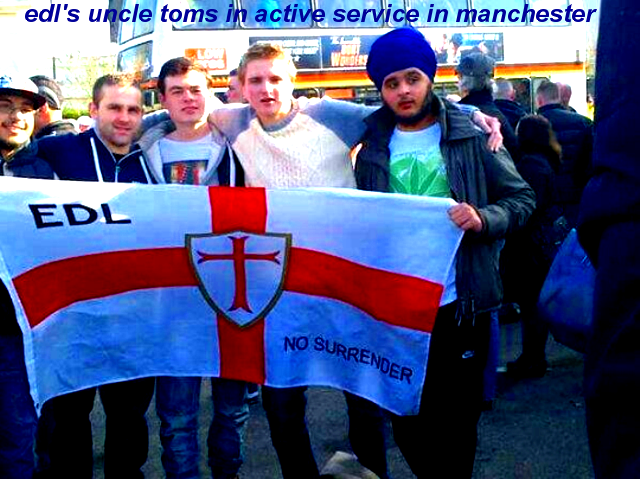 Now what part of that, exactly, disqualifies Jag Singh and other EDL from being genuine “victims”? Jag Singh is a victim of violence from some individuals. Fair enough, the aggressors weren't Leftist activists or Muslims. 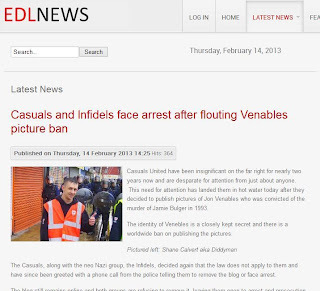 However, EDL News/Extra doesn't know that because it has relied on the news reports. It's as if no person who believes politically incorrect (or non-Leftist) things can ever be the victim of anything – by definition. That is, no matter what level of violence is aimed at what these cretins always call “the far right”, it's always legitimate and acceptable violence; just as banning demos/groups, the Gulag, police violence, surveillance (even by the Snowden-loving Guardian), censorship, etc. 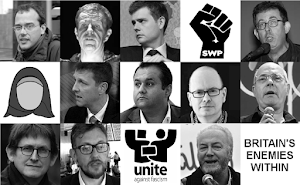 are all deemed legitimate when it comes to “smashing the fash”; yet never deemed legitimate when it comes to smashing, say, revolutionary Leftist or Islamist groups. Again, it seems that - by Leftist definition, members of the EDL can never be the victims of anything. Why? Simply because if people dare to believe the wrong things (politically speaking), then they can never – ever - be victims. Only Muslims and people with black/brown skin (except, it seems, an Uncle Tom like Jag Singh) can be victims . Members of the white (non-Leftist) working class, on the other hand, can only ever be aggressors and "racists" – or so says EDL Extra/News.